Based on our research, we find SingaporeLoveLinks is one of the most popular Singapore dating sites, which means you may more likely find your ideal date on the site than on many other similar sites. If you decide to be a free member, you can contact paid members, but not other free members. This is a reasonable option if you just want to browse the site or currently have a very tight budget. Paid members can contact both free and other paid members. The membership fee is small, compared with your "overall dating expense", including items like movie tickets, dinners, etc. But such minor cost may greatly expand your dating circle, and dramatically improve your dating experience. Some singles also think becoming paid members shows their interests and efforts to find the right dates, so they may be considered more desirable matches, with significantly higher response rates. 1. Complete your profile thoroughly. This not only lets your potential dates know you better, but also makes you look more real and trustworthy. 2. Upload as many photos as possible. Photos are critical for other members decide whether they want to contact you or not. 3. Login to the site on a regular basis. Your ideal match may be waiting for you on the site during your next visit! Badoo is a dating-focused social network app. 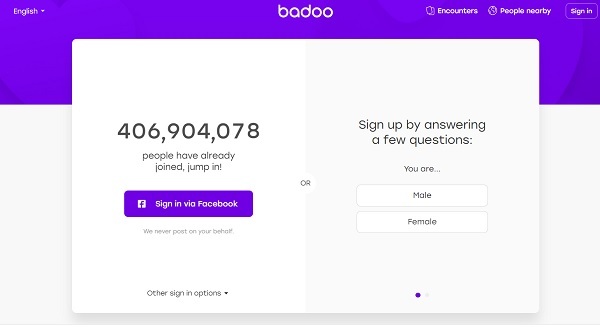 It claims to be the largest social discovery app with over 360 million registered users worldwide and over 300 million messages sent per day. The app is highly popular among Singaporean singles. You’ll find many Singaporean single men and women from Bukit Timah, SengKang, Bukit Batok, Ang Mo Kio, Novena, Choa Chu Kang, Marine Parade, Bukit Merah, Bedok, etc. Based on our research, we find Tinder seems to be the most popular dating app in Singapore. Its idea is simple. After you sign up, you are presented with a series of photos of other members. If you like them, you swipe right, and otherwise you swipe left. Only if both you and another member swipe right, showing mutual interests, a communication can be initiated. The huge popularity of Tinder is an evidence of how powerful such a simple system is. DateinAsia is a 100% free dating site highly popular in Singapore. When we visited the site, we found majority of Singaporean women and men on the site were among 28 to 60 years old. So if you are looking for singles in the age range, you may want to take a close look at the completely free dating site. DateinAsia has a powerful search function. You can search members by relationship status, ethnicity, religion, education, occupation, appearance, body type, and more. OK Cupid is among the most popular Singapore dating sites and apps. The site has attracted many singles from all areas of Singapore, such as Nepal Park, Jurong West New Town, Serangoon Garden Estate, Ghim Moh, Toa Payoh New Town, Yishun New Town, Kampong Kembangan, Saint Michael’s Estate, Hougang New Town, Jurong Town, and Tampines New Town. Unlike some other dating apps, OKCupid thinks you are more than just a photo. The site makes you get noticed for who you are, not merely how you look like. You’ll have plenty of opportunities to present yourself in the profile page. The site uses an algorithm to match you with the ideal dates, and it’s free to use. The site is a huge success in Singapore. Whenever we visit the site, we always find lots of Singaporean men and women active on the site. The dating site has lots of Singaporean women and men as members, so you'll have a good chance to meet a single you may like. However, sg.match.com is more expensive than some other dating sites. Its free members can't send or read messages, so you have to pay a relatively high price to make the site work for you. The site is ideal for anyone looking for a very good dating site with lots of English-speaking Singaporean singles, and willing to pay a price for the service. Meetup is a site and app where events can be organized. 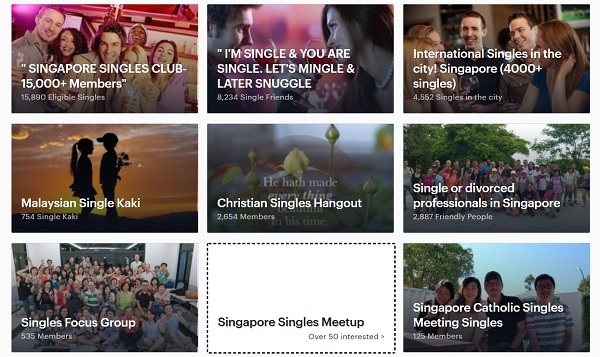 There are quite a few popular Singapore dating and singles event organizers at Meetup. For instance, a group called “Singapore Singles Club” has over 15,000 members, and organized several singles events each month, when we visited the site. For some reasons, “singles” and “dating and relationships” are considered two separate categories at Meetup. You can follow the links to know more of the Singapore singles events and the Singapore dating events. The Social Development Network (SDN), is a governmental body to foster opportunities for singles to interact in social settings in Singapore. When we visited the website, we found over 20 upcoming dating and singles events organized by various private companies. Examples were “Christian lunch session”, “Zodiac compatibility tea”, “fun with board games”, “Yummilicious Ice-cream buffet”, and “lunch with love.” The cost of each event varied from SGD 27.9 to SGD 59.9. So if you’d like to join a local dating event in Singapore, the site may be a good starting point. 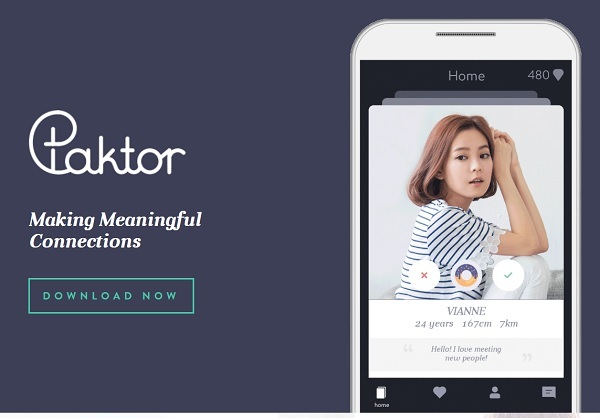 Launched in 2013, Paktor, often dubbed ‘The Tinder of Southeast Asia” is a dating app popular among Singaporean singles. On Paktor, you will be presented a list of photos of members. Then you can swipe right to like or swipe left to pass. Only members showing mutual interests can communicate with other. You can also use filters to narrow down the list of members, by criteria such as jobs and education levels. Owned by the popular dating app Paktor, GaiGai is one of the largest dating agencies in Singapore. Gaigai requires face to face interview to verify the quality of each new member. You can also upgrade to the paid membership, with which Gaigai will do the work of screen and find matches based on your preferences. Gaigai also organizes some dating events, where you can find at the “event” section of the website. Tagged is a social discovery app for members to meet, chat, and date. At Tagged, you can watch live stream, connect with people around you, match with other members based on algorithm, or compete in games. The app has been highly popular in Singapore. With offices in Singapore, Penang, Kuala Lumpur, Jakarta, Hong Kong and Bangkok, Lunch Actually claims to be the first and largest lunch dating agency in Southeast Asia. According to its website, the matchmaking agency has the largest lunch dating membership base in South East Asia, with thousands of eligible professionals and executives, like doctors, lawyers, managers, bankers, engineers, and civil servants. The agency has arranged over 76,000 dates with 85% satisfactory match rate. If you join Lunch Actually, the agency will perform the pre-screening, matching, and date coordination. You only need to show up and enjoy the date. BeeTalk is an app for users to meet new friends or potential dates. You can find interesting activities nearby or lookout to check who's nearby. Another interesting feature is called "whisper", by which messages will be automatically deleted after they are read. The app has a good number of Singaporean users. Coffee Meets Bagel is a dating app where ladies have more control on their dating experiences. Everyday guys receive up to 21 quality matches, whom they can either LIKE or PASS. Then, women can make the choice among men who have already liked them. If you are a Singaporean man and want to date an attractive Filipino woman, Filipino Cupid may be the top choice. Filipino Cupid claims to have over 3.5 million members, so there are lots of choices. The over 1000 success stories are also evidences of the huge success of the site. English is one of the official languages in Philippines, so there is little language barrier. SKOUT is one of the first dating and social discovery app to focus on location. You can browse and connect with other Singaporeans near you to meet a new friend, a date, or even your potential future spouse. The dating website, esync.dating is offered by the Lunch Actually Group, a premier Singapore dating agency. If you join esync, you’ll complete a quiz covering 16 areas of individuality. Based on the questionnaire, you will receive compatible matches. Then you can pick your match and start dating. LunchClick is a dating app to help members find quality singles. Available on both iOS & Android devices, the app emphasizes on quality over quantity. Each day, only 2 to 5 compatible matches will be sent to members. Moreover, the dating app claims about 30% of new registrations are rejected every day. MeetMe wants to become the mobile version of the bar or coffeehouse where everyone belongs. Established in 2005, MeetMe's Android and iPhone app has initiated numerous chats, shares, new friends, dates, romantic relationships, and even marriages. MeetMe mainly targets people 18-34 and it is highly popular in Singapore. Hinge is a relationship app with some Singaporean members. Hinge moves away from casual dating, to focus on real relationship. Therefore the swiping process is removed. Instead, the profile of a user shows stories, photos, captions, and experiences. Its goal is to create connections among those bold enough to seek meaningful relationships. Some Singaporean men use ThaiFriendly to meet Thai ladies online. Unlike some other dating sites, ThaiFriendly is mainly used for casual dates. AsianDating.com is a popular Asian dating site with a few Singaporean men as members. Some Singaporean guys use the site to meet Asian women from countries like Philippines, Thailand, Indonesian, Malaysia, Japan, Korea, and more. POF is a very large global dating site, and claims to deliver over 1 billion massages for its members each month. The site has some Singaporean singles as members. 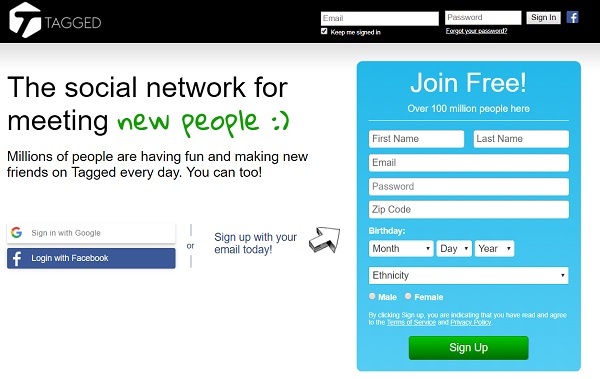 POF is free to signup, browser members, and send, receive, and read messages. But you need to upgrade to a paid membership to enjoy some additional features, like removing ads and reading every member’s extended profiles. LoveStruck is a global dating site some Singaporean members. The site has a nice design and after signing up, you can search members by location, height, age, religion, and more. PinaLove is a popular site for Singaporean men to find casual dates with women from Philippines. Happn helps you find other members whom you've encountered in real life. For instance, the dating app will show members nearby when you sit at a café, or walk around at a party. You can click "heart" button on the people you are interested in. If the interests are mutual, a conversation can be started. If you are a Muslim single in Singapore, and want to find your life partner, you may take a close look at Muslima. The dating app connects you with people whose interests and lifestyles are similar to yours. The app has a small number of Singaporean members. Christian Connection is a popular Christian dating site, with some Singaporean Christian singles as members..
Bumble is a dating app which only allows women to make the first moves. Just like you do on some other dating apps, you swipe right or left to like or pass photos of members. If the interests are mutual, a connection is established. However, at Bumble, only a woman can start the conversation. If she doesn't act in 24 hours, the connection will disappear forever. Vietnam Cupid is a good starting point if you want to meet beautiful Vietnamese women online. Shaadi attracts a solid number of Indian singles living in Singapore. It’s ideal for anyone who wants to date an Indian living in Singapore.